The New QUATRE Absolu De Nuit DUO fragrances are now celebrated in an even more sophisticated evening version. A name that refers to Quatre Couple's search for 'ABSOLUTE'. Absolute Style, Absolute Charisma, the rings as a symbol of Absolute, the fragrance of Absolute Moments. The Modern and daring Olfactory interpretation of the Iconic Quatre ring is shrouded in mystery. At night anything is possible for this contemporary couple, perfection is within reach. 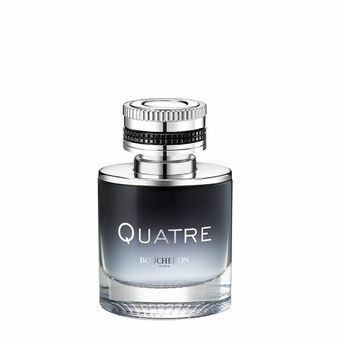 QUATRE for Man, a modern and daring olfactory interpretation of the Maison Boucheron's iconic ring. This Eau de Toilette combines strenght of modernity and softness of maturity. About the Brand: First jeweller of Place Vendeme, Maison Boucheron has embodied excellence in Fine Jewellery since 1858. Its designs enhance women's beauty; they offer grace, light, strength and timelessness. The brand's soulful stones and its unique and immediately recognizable style celebrate the most magical moments in life. Each creation is designed in accordance with Maison Boucheron's values. Alternatively, you can also find many more products from the Boucheron Quatre Absolu De Nuit Pour Homme Eau De Toilette range.